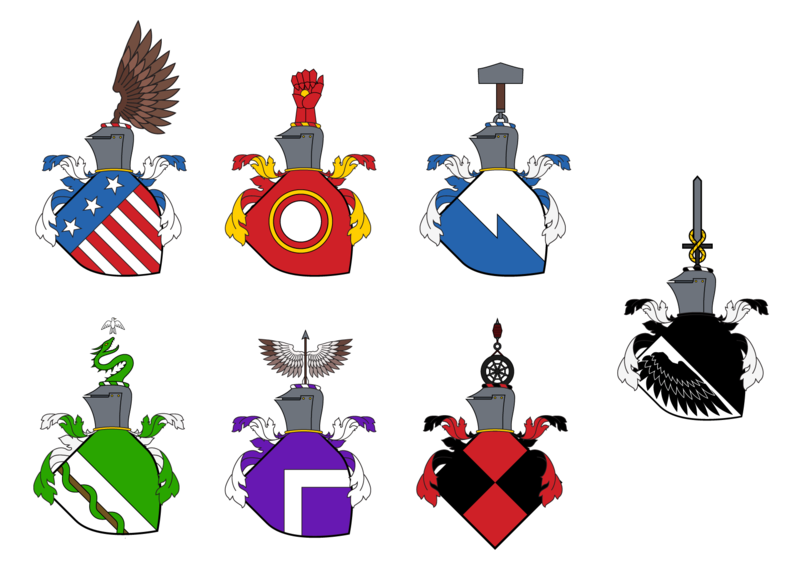 Far from an original idea (I don’t even need to google it to know that there will be a hundred takes on superhero coats of arms) but it was fun to think how I might represent each hero without just resorting to their logo/uniform on a shield. Banner is a personal fave. The two halves of his shield for the two halves of his personality. The left side has a snake wrapped around a staff, a nod to his title (I know he’s a physicist rather than an MD but we do see him treating the sick), by cropping the head/tail of the snake also represents a gamma wave. The snake wrapped around the branch also led to the crest: a dragon chasing a dove. In medieval bestiaries, doves would fly to the Peridexion tree to escape the dragon (the devil) and the tree would keep them safe. On the shield the serpent is climbing the tree, it simultaneously represents the good Banner could do as a doctor and the worst that he lets in to the world. Natasha’s crest is fun too. All the guys have such martial crests but she’s a spy, hers should be more subtle. The wheel has eight spokes (legs) and looks like a spider sat on a web, it also spins thread like a spider, or spins a yarn like a spy. And if fairy tales have taught us anything it’s that a spinning wheel can be pretty deadly: Natasha isn’t the girl pricking her finger on the spindle, she’s the point of the needle. A bit of fun for a Sunday morning.